Open:	11 a.m. – 2 a.m. daily, Friday and Saturday 11 a.m. – 4 a.m.
Las Vegas has no shortage on pubs and bars, but few handle the atmosphere and a full menu of delicious treats as well as Munchbar. Located within Caesar's Palace, Munchbar is made for Sin City life. Its playful atmosphere throws in a little sophistication to cater to differing crowds, and the menu is a delicious mix of comfort foods and typical pub-style fare. 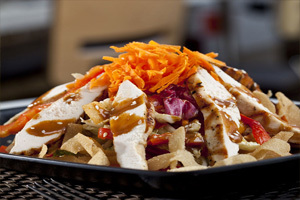 For lunch, dinner, or late night dining, Munchbar is convenient and delicious. Any good pub has its own assortment of delicious appetizers. Take Munchbar's tiny grilled cheese sandwiches, chili cheese waffle fries, munch house nachos, philly cheese steak sliders, sweet potato french fries, or southern fried popcorn chicken. These starters are flavorful and perfect to start any meal off with. They offer unique takes on classic dishes known worldwide. The bigmunch menu offers a little more on your plate and is ideal for a light dinner or the lunchtime crowd. 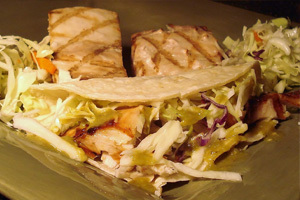 Try the mahi mahi fish tacos, rock shrimp po'boy, reuben wrap, asian chicken wrap, and philly cheese steak hoagie. These delicious dishes are served with a bucket of Munchbar's signature hand cut french fries. Being a pub, you can expect to a bar favorite make an appearance - the hamburger. Served up in a variety of styles and flavors, Munchbar's burgers are juicy, tender, and delicious. Take, for instance, the Munch burger, topped with melted cheddar, tomatoes, pickles, onions, shredded romaine, and a house-made "fancy sauce". It's a classic favorite with a Munchbar twist. There is also the chili cheese burger, bleu cheese burger, jalapeño burger, and, for the bacon lover in all of us, the double munchbacon cheese burger, topped with smoked bacon, cheddar cheese, and a tangy BBQ sauce. Feeling a little bloated after a few days of doing some heavy Vegas eating? Munchbar knows the feeling and offers up a small salad menu for you tender-stomached individuals. Creamy caesar salad, chinese chicken salad, and steak salad are familiar favorites while the munch burger in a bowl - crisp lettuce, tomatoe, smoked bacon, fried onions, and shredded cheddar cheese - is a unique take on what is supposed to be a healthy entree. Munchbar knows the schedules on the Strip can be a little off, so the chef's always have a small, early morning menu available. Try the munch breakfast sandwich, a delicious mix of fried egg, Canadian bacon, and sausage gravy on an english muffin. There is also the barrio burrito, a scrambled egg, hot chorizo, fried potato, salsa verde, and jack cheese stuffed inside of a hearty burrito. These may not be the light breakfast options that keep you going throughout the day, but they're delicious and filling. When you're browsing the Strip and come across Caesar's Palace, it may be best to pop in and grab a bite to eat from Munchbar. Flavor food and a friendly atmosphere make this a great place to kick back and enjoy some time off of your feat.